MySQL 5.7 introduced many new facets to password security. The first thing most notice is that you are assigned a random root password at installation time. You then have to search the log file for this random password, use it to login, and then change it. For the examples on the post I am using a fresh install of 5.7.13 on Oracle Linux 7.1 and was provided with the easy to remember password of nLvQRk7wq-NY which to me looked like I forgot to hit escape when trying to get out of vim. A quick ALTER USER to change the password and you are on your way. 5.7.13 now has the default password lifetime set to 0 or 'never expire'. My fresh install shows that the value of mysql.user.password_lifetime is set to NULL which means use the server default value. 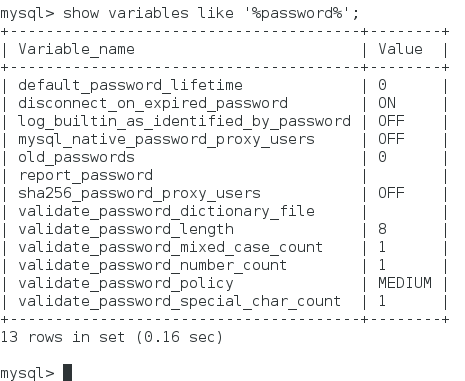 The lifetime is measured in days and stored in the password_last_changed column of the nysql.users table. If the password is expired, you are put into sandbox mode where the only command you can execute is to change the password. That works great for interactive users. But what about your application? It uses a username password pair to talk to the database but it is very unlikely that anyone planned on changing passwords upon expiration. I seriously doubt anyone has set up the exception routine to handle an expired password properly. And if so, how do you notify all involved about this new password --- securely. The best thing would be to set the default password lifetime for accounts used by applications to zero. It simply does not expire. QED & out. But what if your company wants ALL password changed on a regular basis? And they do mean ALL. Earlier there was a listing of the defaults. The test system are set to a password length of eight characters minimum, requires mixed case, requires at least one upper case letter, one special (nonalphanumeric) character, and is of MEDIUM complexity. MEDIUM complexity means that passwords need one numeric, one lower case, one upper case, and one special character. LOW tests the password length only. And STRONG adds a condition that sub strings of the length of four characters or long do not match entries in a specified password file (use to make sure swear words, common names, etcetera are not part of a password). Lets create a dummy account. Checking the entry in the user table, you will find that the account's password is expired. For extra credit notice what the authentication string is set to. We can't have just a password string as some authentication tokens or hashes are not really password. So login as foobar and you will get a notice that the password must be reset before we can do anything else. Your corporate rules may require you to rotate password every N days and set the corresponding complexity. With MySQL 5.7 you can follow what their model is. If you do not have a standard and want to create one, be sure to DOCUMENT well what your standard is and make sure that standard is well known. There are ways to use packages like PAM or LDAP for authentication but that is for another day.